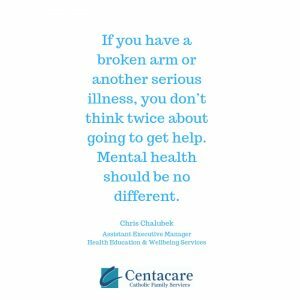 Chris Chalubek was sitting in a GP clinic waiting room when he felt the cold glare of stigma that persists around mental illness. A picture of calm, he didn’t appear to be in crisis but on the inside he was capitulating. “I was in the worst depressive episode I’ve ever had; my current treatments weren’t working and I’d gone to see a GP,” says Chris who has bipolar disorder. “He looked at me and his first response was, `Oh, you don’t look depressed’. “There I was sitting in complete crisis internally and I have a health professional responding like that. What did he expect to see? It was a defining moment for Chris, Assistant Executive Manager of Health, Wellbeing & Education services at Centacare. “I could have just left then and there because, when you’re in crisis, a response like that can make you withdraw even further. Stigma around mental illness due to misunderstanding or prejuidice remains the number one barrier to people seeking support. “Early on I was worried about what people might think so I didn’t reach out and didn’t hear what people had to say,’’ Chris says. Chris is sharing his lived experience in the hope of helping others to reach out for support instead of denying how they feel through fear of being judged. “If we all responded with compassion, that wouldn’t be an issue.